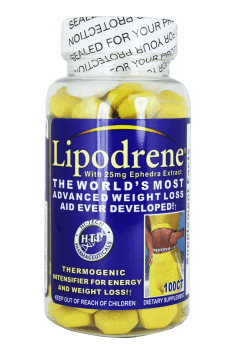 Hi-Tech Pharmaceuticals Lipodrene is an elite product that promotes weight loss with a thermogenic effect. This supplement contains many safe and at the same time extremely effective substances and plant extracts, including up to 25 mg of Ephedra extract per serving. Carefully selected ingredients make the loss of unnecessary kilograms much easier, and the effort put into hard exercises and maintaining the diet is not in vain. The preparation is in the form of easy-to-swallow capsules and is distinguished by a very effective action, aimed at supporting naturally occurring processes in our body. Thanks to this, it helps get rid of body fat in a safe and durable way. Ephedra extract is a natural extract from the gymnosperm shrubs family. This shrub has been used for centuries, including in Chinese medicine, because of its healing properties. It owes them to the presence of numerous alkaloids that stimulate the nervous system and metabolic changes. This extract may intensify lipolysis, raise the heart rate and blood pressure (by narrowing blood vessels), and also increase thermogenesis. This makes it easier to get rid of unnecessary fat and adds energy. Importantly, this extract is devoid of ephedrine and its derivatives harmful to health, and therefore it’s a safe, but equally powerful measure to help you lose extra weight. The Senegalese Berlandieri extract is a rich source of phenylethylamine alkaloids (contains up to 225mg), such as methylsinephrine or phenylethylamine. The synephrine hydrochloride is also present in the supplement with the action similar to that contained in the alkaloids extract. These substances are strong stimulants that increase the metabolic rate, thereby promoting fat burning. They can also act on the body in a similar way to catecholamines (dopamine, adrenaline, and noradrenaline), stimulating the sympathetic system and thus mobilizing the body to function. This is manifested by a quick injection of energy, a feeling of increased motivation, enlargement of the bronchi, increased blood pressure and reduction of fatigue. Persons using preparations with this extract also notice a more effective decrease in the level of adipose tissue. Green tea extract is another invaluable source of numerous fat-burning substances. This extract provides i.e. theobromine and theophylline, as well as polyphenols and antioxidants. Green tea causes the increase of lipolysis, which prevents obesity, and also increases the cell's tolerance to glucose and increases their sensitivity to insulin. The pro-health properties of green tea are also important. Numerous scientific studies have reported that it can have a positive effect on the cardiovascular system and anticancer activity. 5-methoxytryptamine HCl is a popular tryptamine derivative in the form of hydrochloride. It’s a very strong stimulant that stimulates the central nervous system at low doses, which results in improved mood and cognitive functions. It also acts as an aid to fatty tissue distribution processes. Cassia Nomame extract and Hoodia extract are plant extracts from exotic plants with an extremely effective slimming effect. They contain compounds that are inhibitors of fat-digesting enzymes in the digestive tract, so that the body is unable to absorb them. As a result, we provide the body with fewer calories than we consumed with food. In addition, substances contained in the hoodia extract reduce appetite, which can be extremely helpful for people on a reduction diet. Naringin and 6,7-dihydroxybergamotine are substances found in grapefruits and other citrus fruits, such as oranges and lemons. They have a broad spectrum of action, but above all, they enhance lipolysis and lower cholesterol. In combination with synephrine, they can also promote weight loss. Caffeine is a member of the methylxanthine group, causing both mental and physical stimulation. We can find caffeine in coffee, tea or more and more popular yerba mate. It reduces tiredness, improves concentration and improves learning and memorizing processes. This is probably due to the increased secretion of neurotransmitters, such as dopamine and serotonin. In addition to improving cognitive functions, caffeine also plays a key role in supporting fat burning processes. It prolongs the duration of action of some hormones, e.g. thyrotropin, which raises the level of thyroxine responsible e.g. for faster metabolism and fat breakdown. Yohimbine HCl is yohimbine hydrochloride, a compound derived from the bark of the African yohimbe tree. Yohimbine stimulates the sympathetic system, acting similarly to adrenaline or noradrenaline - it raises blood pressure, heart rate and mobilizes the body to function. It’s an excellent remedy for supporting lipolysis (and in combination with caffeine effectively removes cellulite), and also acts as a natural aphrodisiac, raising male libido. 5-Hydroxytryptophan (5-HTP) is an amino acid formed by hydroxylation of tryptophan. It’s a very important precursor in the synthesis of serotonin and then melatonin, which fulfils several important functions in our body. 5-HTP supplementation provides the appropriate level of serotonin, of which too low level could cause malaise, excessive fatigue and even depression. In addition, melatonin formed indirectly from 5-hydroxytryptophan has a positive effect on sleep quality and regulation of circadian rhythms, which supports proper regeneration. 5-Hydroxytryptophan is also an ideal ally in the fight for a healthy figure, because it reduces appetite without causing hunger or irritability. In summary, Hi-Tech Pharmaceuticals Lipodrene is a supplement containing several strong ingredients to help get rid of unnecessary fat. In combination with a properly selected diet and training, it’s an invaluable help in working on your figure. The first tablet in the morning with a meal, the second tablet 30 minutes before workout. One tablet in the morning with a meal. Due to the content of banned substances, the supplement cannot be used by professional athletes taking part in contests controlled by the World Anti-Doping Agency. According to some sources, the supplement’s components can reduce both appetite and thirst. Because of that, special attention should be paid to adequate fluid intake during supplementation. Due to the content of stimulants, do not take other agents with such effect. The preparation cannot be used by individuals with any neurological and cardiovascular disorders. The supplement is designed for advanced athletes who are aware of their needs and the body’s response to strong stimulants. It should not be taken by inexperienced users. Muscle-Zone answer: Dzień dobry, rozumiemy, że produkt nie spełnił Pani oczekiwań. Poprosimy o więcej informacji na temat skutków ubocznych jakie wystąpiły oraz systemu dawkowania jaki Pani stosowała. Theophylline is a natural compound from the group of methylxanthines, which is currently obtained also in a synthetic way. In natural conditions, theophylline can be also found in i.a. tea leaves and cocoa beans. It has anti-inflammatory and relaxing effect, therefore as a drug it finds application in the treatment of asthma. In case of theophylline - as an ingredient of dietary supplements - the mechanism based on inhibiting the activity of phosphodiesterase is the most important here - an enzyme responsible for cAMP breakdown. Theophylline, by being an inhibitor of this enzyme, contributes to the increase of intracellular concentration of cyclic AMP, at the same time increasing thermogenic and lipolytic processes and increasing the ability to concentrate as well as reducing the feeling of fatigue. Therefore, theophylline demonstrates similar activity to caffeine, additionally positively influencing respiration and improving blood flow through kidneys. These properties makes theophylline a valuable ingredient of fat burners and pre-workout supplements. Cassia Nomame – wild herbaceous plant, willingly used in traditional Chinese medicine. It demonstrates dehydrating and laxative properties and has been used in problems with constipations. It was noticed that one of side-effects of its application is weight loss, therefore it started to be used as an element of weight loss supplements. However, according to the current knowledge on this plant, its abilities to stimulate fatty tissue reduction do not result from its laxative properties. Cassia Nomame provides compounds which are natural inhibitors of lipase, therefore it limits the absorption of fat in the human organism. There are also sources which indicate that Cassia Nomame may have thermogenic effect and may stimulate metabolic rate. It makes the extracts from this plant an ideal ingredient of fat burners. Apart from this, the plant has pro-health properties. It may have anti-inflammatory effect, due to which it is recommended in the therapy of arthritis. Some sources also suggest positive influence of Cassia Nomame among people suffering from migraines. Importantly, Cassia Nomame cannot be taken by pregnant and breast-feeding mothers and people below the age of 18. 5-Methoxytryptamine - a compound naturally occurring in the human organism. Enriched in one acetyl group, it creates a hormone melatonin and it is structurally similar to serotonin. It is also known as mexamine. Biological activity of 5-metoxytryptamine should be considered due to its structural similarity to serotonin. It is an agonist of serotonin receptors 5-HT1, 5-HT2, 5-HT4, 5-HT6 and 5-HT7. Because of this, it has stimulating influence on the functioning of the organism and increases the level of cyclic adenosine monophosphate in cells. Thanks to this, it stimulates metabolism and increases the effectiveness of stimulating catecholamines. Because of this activity, it is used in fat burners in order to maximize the pace of weight loss. Some source also suggest the ability of 5-methoxytryptamine to promote cognitive functions.